In old PCB&apos;s i found a low-capacity FPGA(CPLD) - EPM7064. I decided to make a small evaluation board. This project was created on 09/06/2018 and last updated 5 months ago. In this project I tried to make the simplest FPGA board. Also, I tried to find real tasks that can be solved with the help of FPGAs of such small size. Based on this board, I made several training projects. I&apos;ll post them a little later, as soon as I figure out how. This is a prototype from scratch. Therefore, I did not make a scheme. I connected all the pins of the CPLD with the pins on the ends of the board. Instead of soldering, I used a wire wrapping. Soldered wires only to FPGA pins. I attached a description of each pin of the board. See PDF of MAX 7000 series. After that it became known to which pins to supply voltage. In FPGA are several VCC inputs. I combined them and brought them to a separate pin - VCC/GND, to which I will feed the entire board. The chip works from 5 volts. I shunted each separate VCC input with a capacitor. Out of 10 pins, I made a programming connector. Attach pin description. With the wrapping, I connected the corresponding pins of FPGA and connector. A minimum of actions, but it is ready to work. It is already possible to flash the firmware and it can work singly. Geez that&apos;s some fine-pitch hand-soldering work! Nice job! Thanks! I do not have a soldering station. I work as an ordinary soldering iron with a copper bit. I have one, but after I blew through my supply of tips, it got modified to use copper roofing nails. Infinite supply of tips for like $5. They wear out pretty fast if you leave the iron on due to the lack of a protective coating, but I don&apos;t think twice about grinding them to whatever shape I happen to need. You can get an ultra cheap Hakko 936 clone control board, and a 936 style handle, for less than $3 usd each/shipped on AliExpress. You really want the iron to have a 60w element. The DC resistance of the element should be 9.5ohms to 10ohms max. If the resistance is 10.5 to 12 ohms the element is a 50w version, 12 to 13 ohms is a 40w and there are some mains voltage versions that will measure around 1k. I&apos;m mentioning it because all of these elements look identical externally and Chinese sellers are bad about sending the wrong ones. You can build an adjustable iron for less than $10 this way. To be honest, I&apos;ve tried the cheap hakko clone tips and I&apos;ve made my own copper tips too (for 2 other irons). The real deal Hakko tips last much much longer than anything else, and they are much easier to use. your results will be much better. I highly recommend trying one to see for yourself. The only other thing you really really need when getting started is some good quality solder that is 0.8mm or smaller. Most people use 0.8mm as the standard size on a work bench. 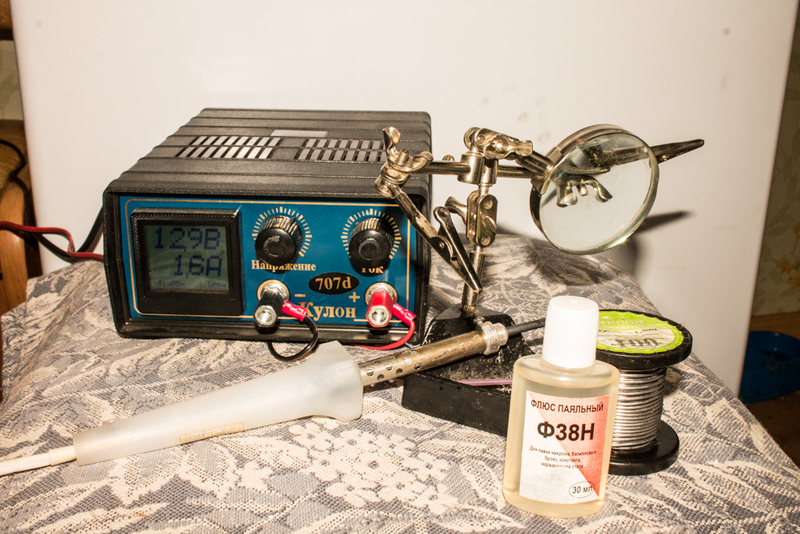 Get reputable solder and be sure it is leaded. Leadfree is a joke, it is terrible stuff to work with. This board is designed to create prototypes and ready-made devices. There are options for soldering and solderless installation. You are about to report the project "The FPGA evaluation board - Frankenstein", please tell us the reason.